Republican Jay Ashcroft has defeated Democrat Robin Smith. Jay Ashcroft speaks at the Drury Inn in Brentwood. 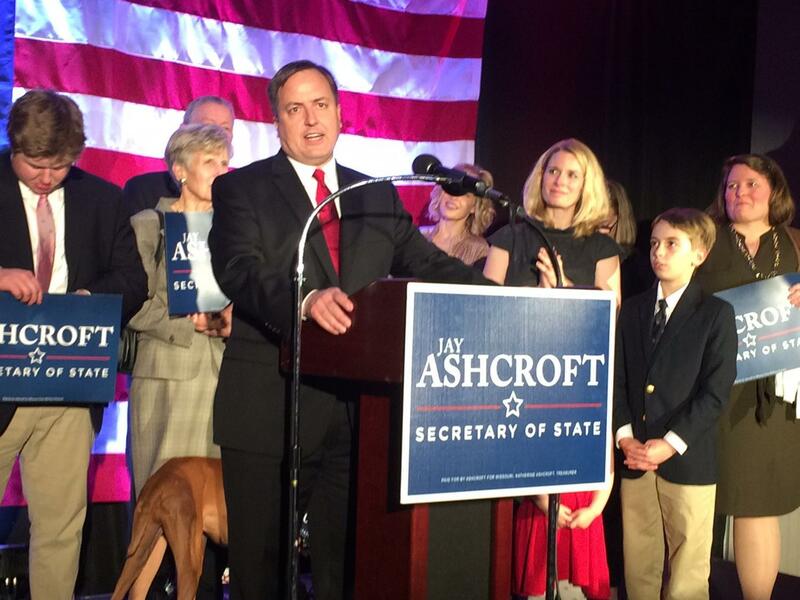 Accepting his win tonight, Ashcroft said that throughout the campaign, he heard voters focus on a few specific issues. Ashcroft is an attorney and engineer, who lost a 2014 bid for state Senate and has never before held public office. His father, John Ashcroft, served as Missouri’s auditor, attorney general, governor and U.S. senator. John Ashcroft also served as U.S. attorney general under President George W. Bush. Ashcroft’s father, John Ashcroft, said that he thought that the election returns on Tuesday nationwide showed that more people were voting against something that they were voting for something. And, he said, there are two ways to win in politics: playing offense or playing defense. Still, Ashcroft said he did not think the results of the balloting were a defining moment for the American character, and he hopes they represent a victory for what he called common sense conservatives. Jay Ashcroft backed Amendment 6, which would allow the state government to require voter photo IDs at public elections. His opponent strongly opposed the voter ID amendment. Smith is widely known for her four decades as a television reporter and anchor in St. Louis. Republican Eric Schmitt won Missouri’s race for treasurer over Democratic Judy Baker. 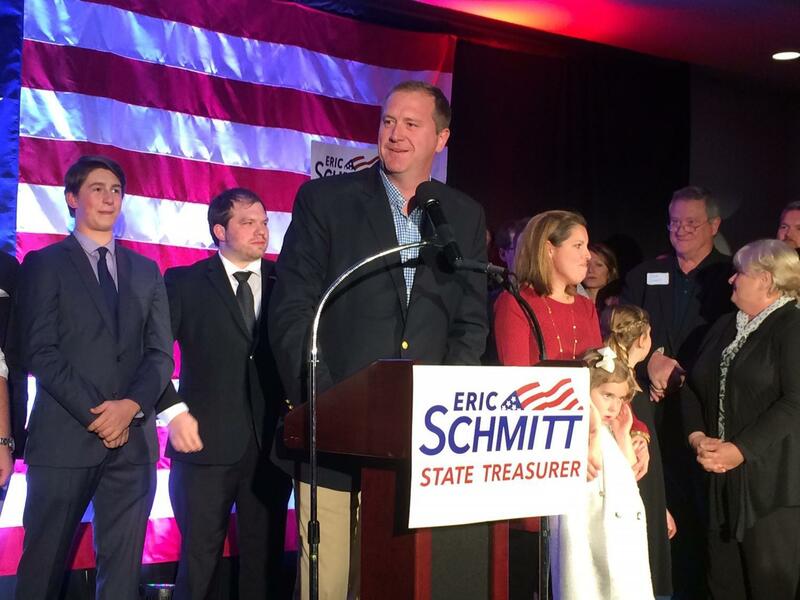 In his victory speech, Schmitt said he’s part of a changing of the guard ushered in by Missouri voters Tuesday night. As treasurer, Eric Schmitt plans to more closely monitor where the state money goes. “That generational change comes with significant responsibility,” Schmitt said. “It requires proving yourself to generations past and earning the respect of younger generations." Schmitt is a state senator from Glendale. In this campaign, his chief focus was blocking any state investment dollars from going to companies that conduct business with countries that promote terrorism, notably Iran, Syria and Sudan. Schmitt, who has a son with autism, points to his work to persuade the General Assembly in 2010 to pass a bill requiring insurers to cover treatment for autistic children. He was the major sponsor of legislation in 2015 that revamped state law regarding fines and fees that can be imposed by local courts. Schmitt first won his state Senate post in 2009. He would have reached his term limit at the end of this year. 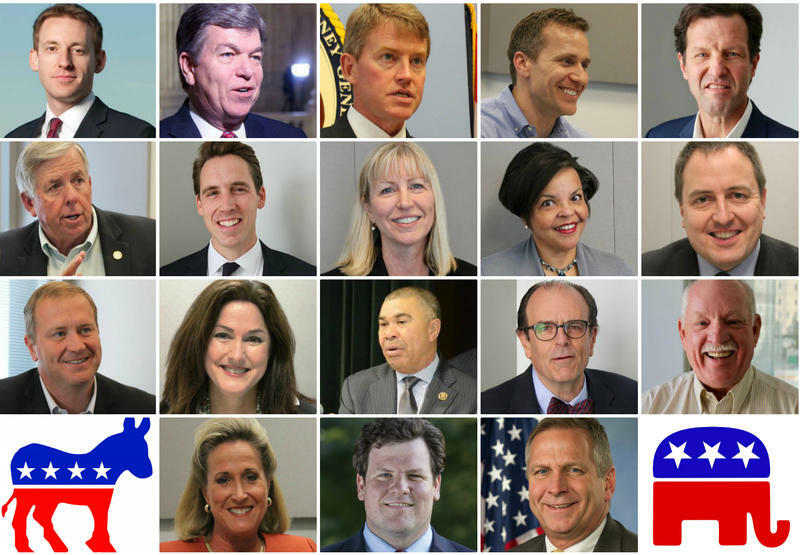 Republican Mike Parson will be the next lieutenant governor of Missouri. Parson, of Bolivar, previously served six years in the Missouri House and is the former sheriff of Polk County. Speaking in Springfield, Missouri, he said the Republican, conservative victory was important "to give our kids and grandkids the same rights we had." In running for office, he stressed a need to work with Democrats and talked about the need for more civility. “We've gone way out of bounds to try to describe one another in a political arena, and there's a huge difference in trying to show a contrast between one another, and just trying to destroy people to win an election,” he said. 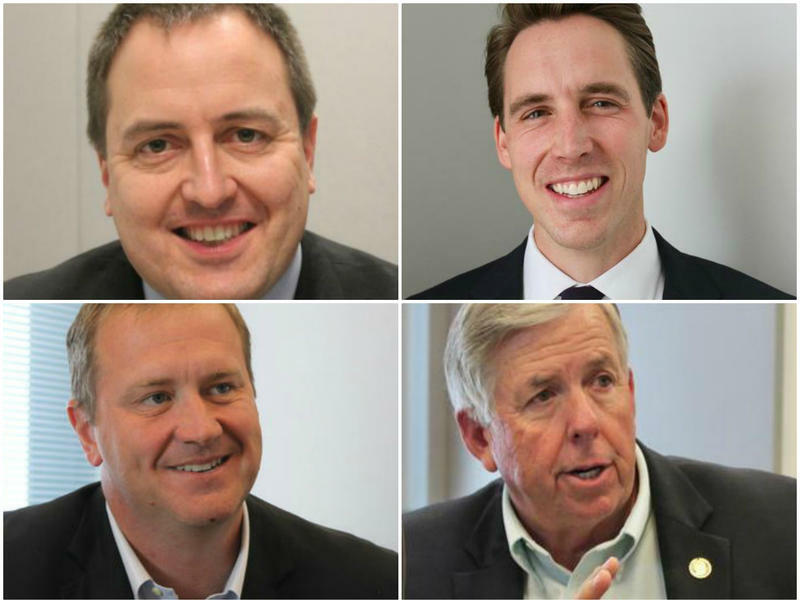 The next attorney general will be Republican Josh Hawley. The law professor at the University of Missouri-Columbia has stressed his background as a constitutional lawyer. He was a clerk for U.S. Appeals Court Judge Michael McConnell and U.S. Supreme Court Chief Justice John Roberts. He was part of the legal team that prosecuted the “Hobby Lobby case,” which overturned the Affordable Care Act’s provision that required employers to include contraceptive coverage in the health insurance plans provided to employees. He says his experience as an appellate lawyer fits with what the attorney general actually does. He has also proposed setting up special units within the attorney general’s office to focus on public corruption and to challenge overreach by the federal government. He defeated former Cass County Prosecutor Teresa Hensley. Democratic incumbent Lacy Clay, University City, defeated Republican Steve Bailey to keep his long-held seat in Missouri’s 1st Congressional District. Clay was heavily favored to win after defeating state Sen. Maria Chappelle-Nadal and St. Louis School Board member Bill Haas in August. The 1st Congressional District encompasses St. Louis and parts of St. Louis County. Lacy Clay and his father, Bill Clay, have represented the 1st District since 1969, and in the process have cultivated one of the state’s most significant political organizations. Bailey, Lacy Clay's his opponent, in March won the GOP primary against fellow Republican Paul Berry III to face an uphill battle to unseat Clay, because the 1st District is solidly Democratic. While Bailey has never held elected office, he’s run several times for Congress. In the 2nd Congressional District Republican Ann Wagner, Ballwin, will keep her seat in Missouri’s after beating out Democrat Bill Otto. Before the Ballwin resident was elected to Congress in 2012, she served as the head of the Missouri Republican Party, co-chair of the Republican National Committee and ambassador to Luxembourg under President George W. Bush. She easily won re-election in 2014 in the district that tilts toward Republicans. Since taking office in early 2013, Wagner quickly has made her mark. She has a leadership position as the freshman representative to GOP leadership in the House. In Illinois, U.S. Rep. Mike Bost, R-Murphysboro, has won election to a second term representing the 12th congressional district. The 55-year-old former state legislator sited his experience during his campaign and said his main goal was to cut regulations, especially on coal mines. He is adamantly opposed to the Affordable Care Act, wanting to start a slow and steady replacement that includes health care coverage for people with pre-existing conditions. Bost defeated Democrat C.J. Baricevic, a lawyer, and Green Party candidate Paula Bradshaw, a nurse. Dale Singer contributed to this report.